Well happy 2016 to you! This year I am skipping the 'review of 2015' and the 'what I didn't do' post and I am jumping straight in with something new for this year on the Mrs Crafty B blog. Having taken a lovely long break from the crazy over the festive period and deciding that I have become completely overwhelmed with my schedule, I have concluded that I no longer make time for myself and that it is something I need to do. I KNOW that I am not alone in this. Many of you will be guilty of the ignoring the importance of time for yourself and getting swept up in the activity of day to day life, work and family. I have decided to dedicate my Tuesday evening to continung with my hobbies (which have gotten a bit burried over the last year.) I am not going to lecture you on the importance of a hobby or the therapeutic benefits. I am simply going to say that we all deserve a bit of time for ourselves. To regroup, focus on something non stressy. To forget the mundane tasks of everyday life. So will you join me and pledge one and a half hours of your time for YOU. You don't have to craft if it's not your thing. Maybe you can vow to spend the time reading or doing something else that you wouldn't normally do. If you can only do one hour than fine. If you miss one week then no problem. Here's how to join in and make sure that you DO. Decide how you are going to spend your time. Pick up an old project. Learn a new craft. Grab that colouring book you bought 15 weeks ago and haven't looked at since. Paint your nails! Use your 1.5 hours for YOU. Focus on your project and at 9pm, let us know what you achieved. 6 rows of knitting? One embroidered flower? 6 clay items? Whatever you have done; big or small. Will you dedicate some time for you? Do you enjoy crafting? Do you fancy learning something new? I hope to see you on a Tuesday evening very soon! Such a lovely idea. Gutted I won't be able to make it though as I attend a local yoga class on a Tuesday evening (which I suppose could be seen as time out for me) I need to spend more time crafting and doing things for myself this year though. i had started to do it towards the middle of last year but then life and chores just got in the way again. Happy New Year to you! 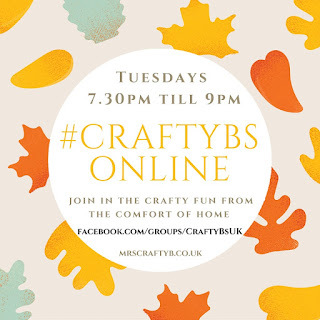 Don't forget to join the crafty natterings and share your projects if you do get round to some crafting! I'm glad you will be getting some 'me time' on a Tuesday! I'm yet to find a yoga class I can get to. I love it!